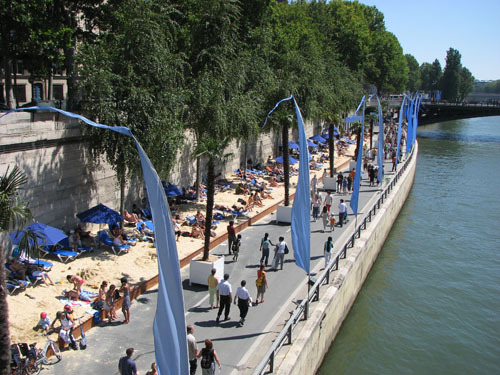 Today’s article on Interesting Thing of the Day is about Paris Plages, the city’s yearly project to create artificial beaches in the center of town, including a 3 km stretch along the Seine. Parisians and tourists alike seem to think this is the Greatest Thing Ever, or at least the next-greatest thing to the new Velib’ bicycles all over town which you can rent by the hour (first half hour free). I’ve never been much for sunbathing myself, at least not since that band trip to Florida back in 12th grade during which I spent a whole day baking on the beach—without sunscreen, natch—and ended up with second-degree burns on most of my chest and back. Good times. Anyway, that painful recollection aside, I don’t really get excited about any aspect of the beach scene—noise, crowds, heat, sand—except for the scenery, which isn’t particularly beach-like here. But, I must say I was tempted by the beach volleyball (I embrace contradiction) and the t’ai chi area. So there really is something for everyone.